Two foreign students in rural Idaho go looking for the flavors of home. Iva Oberknezev is from Novi Sad — a Serbian city the size of Spokane, founded in the 1600s on the banks of the Danube River. And Zhaoyue Zhang — who likes to be called Lucy — is from Huzhou, a Chinese city in the northern Zhejiang province that’s over 2,000 years old. The teenage girls are from separate countries with unique traditions and languages, but they have a lot in common. For one thing, they’re both exchange students spending their senior year around the globe from their homes, among the pine trees of Spirit Lake, Idaho, and the hallways of Timberlake High School. Their education there — English, consumer economics, algebra, art — goes well beyond reading and writing. Like thousands of exchange students across the country, these girls are absorbing American culture through television and shopping, interacting with new friends and learning traditions from their host families. But sometimes, they miss home. And though they’re ready to experience America, they long for familiarity. And sometimes, that means familiar food: the stuffed cabbage rolls of Serbian cuisine or, for Lucy, her father’s homemade chicken soup. Christine Sandahl, their host mother and a teacher at Timberlake, lets the girls take over the kitchen of her home. Iva likes to make desserts. Lucy recently made rice porridge with black mushrooms and sushi, which she brought to Timberlake and shared with the principal. Sandahl, who (full disclosure) I teach with at Timberlake, wants to see these girls happy. So we devise an adventure to make them less homesick — but to also learn more about their culture. Can Iva find authentic pierogi in Spokane? Are there any Chinese restaurants serving food that Lucy would recognize from her home country? We all hopped in a car and started exploring. We don’t find any specifically Serbian restaurants, but there’s a thriving Russian community in Spokane. I was sure that one of the markets has many foods she would recognize. At the mention of European chocolates, Iva flashes a rare, dazzling smile. “Food makes me happy,” she says. The tall, reserved girl with gray-blue eyes and long black hair actually giggles. We are greeted warmly at Mariupol Deli and Bakery by Igor Chubenko, who came to the United States from Ukraine at age 5. Cyrillic writing on the store’s brightly colored food wrappers catches her eye — and soon she’s zipping around the store, her voice rising with every new discovery. “Oh, this!” she says picking up bags, bottles and cans, “I must have this!” She piles items on the counter: frozen sremska sausage, csipetke dried pasta (ideal for goulash), and lots of chocolates and sweets. The real find, however, is a jar of cabbage for the stuffed cabbage rolls she’s been craving. Sandahl smiles as Iva carries out six grocery bags. “We’ll be doing a lot of cooking this weekend,” she says. At China Garden, chef and coowner Raymond Kong presents us with a feast fit for royalty. He discusses the menu with Lucy, occasionally stumbling over their not-quite-compatible dialects. 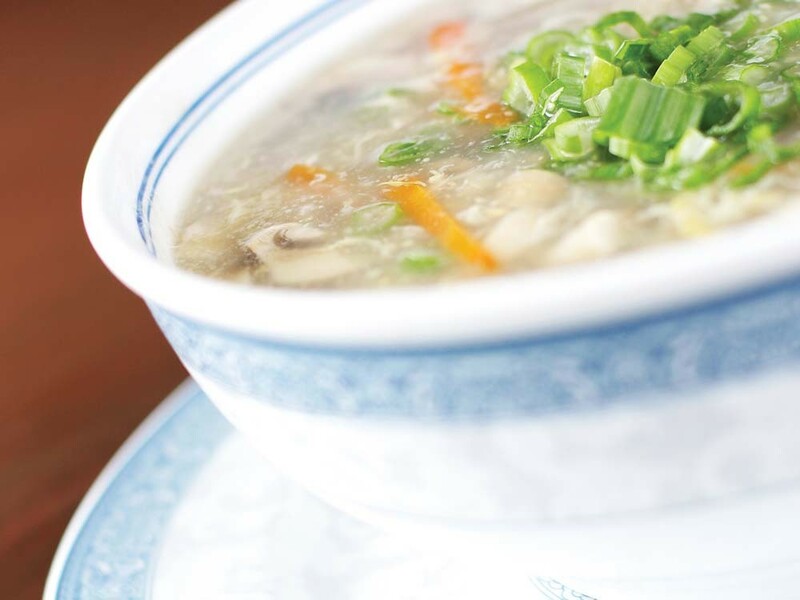 We settle on egg flower soup, melt-in-your-mouth honey walnut prawns, sweet onion beef, and steamed asparagus served Hong Kong-style (meaning the vegetables are dressed with a light soy sauce and sesame oil mixture). While we eat, Lucy explains that she is used to much less tender beef. In China, beef is often pounded thin, yet Americanized versions of Chinese beef dishes use comparatively tender beef. She actually prefers vegetables, she says, helping herself to the last portion of asparagus. And she loves fish, especially the whole steamed fish — caught fresh from Taihu Lake — that her father makes. As we wait, Lucy talks in broken English about missing her father, whom she does not get to speak to very often, she says, her already soft voice trailing off. But she relays how happy she was to hear two women speaking Chinese at a recent outing with Iva at the Spokane Valley Mall. I remember an exchange student from Russia who was shy and also struggled with English. Our former vice principal happened to speak Russian so I asked him to talk with the girl about school issues and whether or not things were going OK. I don’t remember what he said but hearing her language spoken transformed her face: surprise, melancholy, but also tremendous gratitude. At the restaurant, Kong returns to surprise Lucy with a spicy tofu dish. Her face lights up. The aroma of jasmine tea, the tang of pickled cabbage, a sudden burst of a familiar language in a faraway place. These things connect to our memories of home, reminding us of the experiences we’ve shared with loved ones. And, hopefully, they help forge new memories in these kids’ new home away from home. Mariupol European Deli and Bakery • 2915 S. Regal St. • Mon-Sat from 10 am-7 pm • 535-3088 • China Garden • 4410 South Regal Street • Daily from 11 am-10pm • 448- 6282.